This 2 bedroom apartment with swimming pool is located in Rosolina Mare and sleeps 6 people. It has WiFi, air conditioning and barbeque facilities. The apartment is within walking distance of a beach. Feature: Property on a campsite. Equipment: electric heating; air conditioning (in the living room). Access/parking: at night no access to the complex for cars. Estate (shared use with holiday guests): approximately 45 ha, closed plot, trees. Pool (shared use): 33.0 x 15.0 m, 18/05/19-15/09/19, children's pool, slide. Pool area: sun loungers (depending on availability), sunshades (depending on availability). Pool 2 (shared use): 400 m², 18/05/19-15/09/19. Sports facilities/ leisure time: shared use (free of charge): beach volleyball, basketball, bowling/boccia. Shared use (payment): tennis, multi-purpose sports track, crazy golf, bikes, fitness gym. Entertainment: included: sport animation (approximately middle of June until middle of September). Day care: included: animation for children, babyclub (approximately middle of June until middle of September). Infrastructure: washing machine (coin-operated); dryer (coin-operated); internet access Wi-Fi (included) at the restaurant. Bar/cafe, restaurant, food shop, kiosk, shuttle service. Beach service: at the beach: sun loungers, sunshades (payment). Important information: No motorbikes (mopeds and scooters included) in the holiday complex. Plot description: 1 x parking near the house; parking in the holiday complex (payment). Terrace (partially roofed, wood terrace), furnishing provided, 2 deck chairs, barbecue. The agent describes this apartment as an ideal holiday rental for the summer holidays. For younger guests there is some vibrant nightlife not too far away. It is also good value for money. 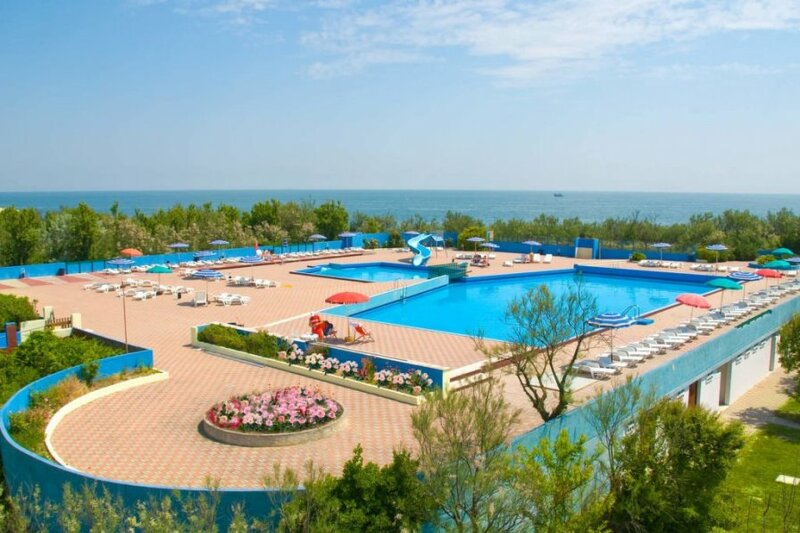 The apartment has a swimming pool and is located in Rosolina Mare. It is set in a very convenient location, just 0 metres away from a beach and only 900 metres away from the city center. The apartment has free wireless internet. The apartment is adequately equipped: it has air conditioning and a washing machine. It also has a BBQ and a tennis court.